With summer in full swing, road construction projects are taking place throughout Cherry Hill. Resurfacing began at the end of this week on Dell Drive and Oakley Court. Crews are currently scheduled to mill portions of Howard Road and Cambridge Road next Monday, July 15, and are expected to begin paving both roads on Tuesday and Wednesday. Additionally, milling is scheduled on Dorset Road and Greentree Road on Wednesday, with paving of both roads slated for Thursday. All work will be completed as the weather permits. Residents on the affected roads will be notified by door hanger before work commences. Updates on these road projects will be posted on the Township's Facebook page and Twitter feed as necessary. For more information, please contact the Cherry Hill Township Engineering Department at (856) 424-3203. 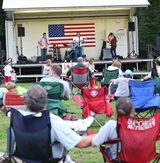 The Township's "Music Under the Stars" summer concert series began last Tuesday with an evening of free rock, pop, and a twist of country, courtesy of the Larry Stevens Band. The series, sponsored by Concentra and Metro PCS, continues this Tuesday with the sounds of Hank's Cadillac. Bring a blanket, a chair, and even a picnic dinner - just don't forget your appetite for great music! An up-and-coming opening act begins playing at 6:30 p.m. followed by the night’s featured musical group. Young children will enjoy some time on the moon bounce! Special thanks to Short Hills Deli for providing healthy snacks, and B101 for their continued support of this terrific concert series. The series continue on July 23 and July 30. Shows are cancelled in the event of rain. For more information, click here or contact the Recreation Department at (856) 488-7868 or Events@chtownship.com. The all-volunteer Cherry Hill Trail Crew is inviting new volunteers to three events in July. The crew’s monthly trail maintenance session will be at Kresson Trails from 9 a.m. to noon tomorrow (Saturday, July 13). Volunteers should wear long pants and sturdy shoes and are advised to bring a water bottle or hydration system. Tools and work gloves will be provided. Volunteers will meet in the Kresson Trails parking lot near the intersection at Kresson and Springdale roads. Can’t make it to tomorrow's event? You can still help our trails! Join crew members and neighborhood volunteers to help build a raised footpath at the Barclay Farmstead trail on July 22. Additional information can be found at the crew’s Facebook page. Questions can be directed to Jay Jones at (856) 470-8967 or via email to chtrailcrew@gmail.com. The Trail Crew is part of Cherry Hill's Environmental Advisory Board; for more information on the board, or to apply for a spot on any of Cherry Hill's volunteer boards or commissions, click here. Last Sunday, Council members Jim Bannar and Susan Shin Angulo helped welcome home a local hero. Dozens of friends, family and community members came out to celebrate Army Specialist Francesca "Chessie" Vollaro, who returned from Afghanistan in June. Vollaro, 21, joined the Army after graduating from high school in 2010. The local resident was shocked at the homecoming she received, greeted by her entire family, Council members, County officials, the Cherry Hill Police and Fire Departments, the the Warriors Watch Riders and members of Operation Yellow Ribbon. It was a wonderful celebration, and a fitting way to wrap up the Independence Day weekend. Welcome home, Chessie! 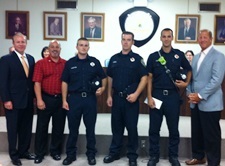 At the July 8 Township Council meeting, Township Council and I were proud to recognize Cherry Hill's newest firefighters, Andrew Gottsch, Jason Macri and Shawn Doran. The three men recently graduated from the department's Training Academy, and began their careers as members of one of New Jersey's finest public safety organizations. Cherry Hill's police and fire departments consistently produce highly skilled and well-trained professionals who are passionate about protecting the citizens of our community, and we were proud to welcome these three men into the Fire Department's ranks. With summer in full swing, road construction projects are taking place throughout Cherry Hill. Resurfacing began at the end of this week on Dell Drive and Oakley Court. Crews are currently scheduled to mill portions of Howard Road and Cambridge Road next Monday, July 15, and are expected to begin paving both roads on Tuesday and Wednesday. Additionally, milling is scheduled on Dorset Road and Greentree Road on Wednesday, with paving of both roads slated for Thursday. All work will be completed as the weather permits. Residents on the affected roads will be notified by door hanger before work commences. Updates on these road projects will be posted on the Township's Facebook page [https://www.facebook.com/#!/pages/Cherry-Hill-Township/134342599655] and Twitter feed [https://twitter.com/CherryHillTwp] as necessary. For more information, please contact the Cherry Hill Township Engineering Department at (856) 424-3203. Bring a blanket, a chair, and even a picnic dinner - just don't forget your appetite for great music! An up-and-coming opening act begins playing at 6:30 p.m. followed by the night’s featured musical group. Young children will enjoy some time on the moon bounce! Special thanks to Short Hills Deli for providing healthy snacks, and B101 for their continued support of this terrific concert series. The series continue on July 23 and July 30. Shows are cancelled in the event of rain. For more information, click here [http://www.cherryhill-nj.com/DocumentCenter/View/1607] or contact the Recreation Department at (856) 488-7868 or Events@chtownship.com [mailto:Events@chtownship.com] . Can’t make it to tomorrow's event? You can still help our trails! Join crew members and neighborhood volunteers to help build a raised footpath at the Barclay Farmstead trail on July 22. Additional information can be found at the crew’s Facebook page [https://www.facebook.com/CherryHillTrailCrew] . Questions can be directed to Jay Jones at (856) 470-8967 or via email to chtrailcrew@gmail.com [mailto:chtrailcrew@gmail.com] . The Trail Crew is part of Cherry Hill's Environmental Advisory Board; for more information on the board, or to apply for a spot on any of Cherry Hill's volunteer boards or commissions, click here [http://www.cherryhill-nj.com/index.aspx?NID=84] .